As we have highlighted in one of our very first blog on internet usage statistics, come heavy taxes or high charges, Sri Lankans love to stay in touch and be online. During the year of 2016, we Sri Lankan went on to subscribe to 1.5 million cellular mobile connections and over 300,000 broadband and dial-up internet connections, increasing Sri Lanka’s internet penetration to a 30% and to our total internet users to a 6.1 million. Despite Sri Lankan government’s recent removal of telecommunication services from the 15 percent value-added tax exempt list and the steps taken by 2017 budget to remove tax holidays given to data leading to 50% effective taxation on mobile services, the Sri Lankan’s urge to increase their connectivity for educational, recreation and occupational reasons have remain sturdy through the years. 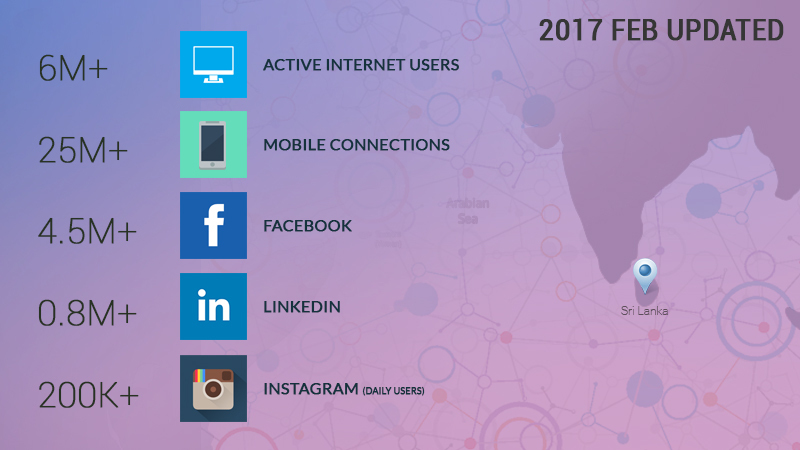 Sri Lanka’s increased internet connectivity also have given a boost to the Sri Lankan’s presence in the social media, especially on the Facebook, the favorite local online hangout. Starting from mid-2016, the Sri Lankans number on Facebook increased from a 4 million to a 5 million and incidentally more women between the ages of 18-24 were on Facebook than men. The genders reached the equal ground in the age group of 25 -34 years and men took over hence then. This behavior of Sri Lankans stands quite different to the global trend of one billion Facebook members, where men were the majority in every age group. True to their urge to stay connected, most of Sri Lankan Facebook fans showed an intense interest in mobile brands and Dialog and Mobitel were among the top branded pages with the highest number of Sri Lankan fans. Kumar Sangakkara still holds the lead as the most favorite celebrity in Sri Lanka with over one million local fans. A newer and a recent local trend on Facebook was the Facebook communities, which generally shares an opinion, jokes, and individual opinion. The English and Sinhala versions of Gossip Lanka News were among the most liked Facebook community pages by local fans, reflecting our penchant for gossip! Hiru FM and Hiru news were the most preferred local Facebook pages with the highest number of local fans and Lankadeepa was the only print media brand in a list vastly ruled by electronic media channels. While Instagram, the visual communication platform of Facebook seemed to be making headway among Sri Lankan social media users with its numbers taking a major jump from a 120,000 in October to a 160,000 in December; Twitter still fails to identify the Sri Lankan twitteraties as a force to reckon with, mostly due to their still small numbers. Yet telecommunication brands managed to hold onto the top positions in brands on Twitter with the highest number of followers While Kumar Sangakkara was the local celebrity with the highest number of Twitter following only second to Bollywood actress Jacqueline Fernandez. Among the most visited websites in Sri Lanka local sites like hirufm.lk, ikman.lk and gossiplankanews.com were among the top ten suggesting an increasing interest on web-based news sites and e-commerce. Yet what do these numbers suggests to digital marketers? And influencer marketing online can be a reality in the year 2017.